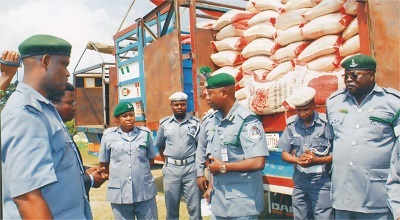 It is gathered according to newsmen, the Federal Operations Unit, Zone `A` of the Nigeria Customs Service intercepted 10 trailers loaded with parboiled rice and other contraband goods with Duty Paid Value of N1.62 billion, from March 9. The Area Controller of the command, Comptroller Mohammed Garba, made the disclosure to newsmen in Lagos on Wednesday. According to him, the unit also generated N166. 20 million from March 19 to April 9 from duty payment and demand notices on general goods from seaports, airports and land border stations. “The command also intercepted contraband with DPV of N1.46 billion between March 19 and April 9. 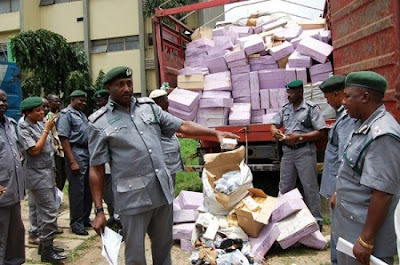 “The seized items include Indian hemp (cannabis sativa), 64 exotic vehicles, 6,003 bags of foreign parboiled rice (equivalent of 10 trailers loads) 963 cartons of frozen poultry products. “Others are: 431 jerry cans of vegetable oil, 163 bales of used clothing, 569 pieces of used tyres, 69 bags of sugar and four containers, among others. Garba said that the 570 parcels and 98 sacks of cannabis sativa weighing 1,550kg were intercepted on the Olorunda axis of Ogun State, following a tipoff. “These Indian hemp was the highest seizure of such hard drugs in the history of the command. “Such a drug will have negative effects on consumers if it escapes to the public. “In the spirit of inter-agency relationship, the seized Indian hemp will be handed over to the National Drugs Law Enforcement Agency for further investigation,” Garba said. According to him, the command evacuated 2, 671 bags of 50kg parboiled rice from nine storage houses in Ilogbo, Abeokuta. He said that the evacuation was done by the Lagos Roving Team complemented by other teams of the service. The controller said that there were mob attacks on customs operatives but the officers were not deterred from performing their statutory responsibilities. He that said the seized 64 vehicles, including Toyota Land Cruiser, 2018, 1 Escalades 2017 Cadillac, 2014 Range Rover and 2014 Toyota Highlander, had DPV of N258 million. Garba said that the command intercepted three 40ft containers and one 20ft container classified CSNU 106087/4 containing 2, 260 cartons of Gonca Spagetti and 530 packages of Rifle Energy drinks. He said that the goods were intercepted as a result of false declaration, adding that they were declared as baking powder. “A 40ft container No. PCUI 865957/1 was seized for carrying 200 cartons of ladies shoes, 134 cartoons of children shoes, among others. “Another 40ft container No. FCIU 80992/0 was seized for carrying 2,300 cartons of tiffany chocolate, 385 cartons of tiffany crunch cream biscuit as against tappet for pump. A total of 10 suspects were arrested in connection of these seizures,” Garba said. He commended the support of the Comptroller-General of Customs, Col. Hameed Ali (rtd) and his management team for providing adequate logistics for the command to succeed. He also commended the Nigerian Army and the Nigerian Police for their support. He pledged that the command would not relent in its efforts to bring down smugglers and improve government revenue. While receiving the intercepted cannabis sativa from customs, Mr Lawal Opeloyeru, the NDLEA Principal Officer (Operations and Intelligence), hailed NCS for the feat. He promised that NDLEA would carry out further investigation on it. Opeloyeru acknowledged the contributions of NCS in the fight against illicit drug peddling. He said that the NDLEA could not win the fight without the support of other agencies and members of the public.